Process and customer orientation are major elements in management function. Process orientation of an organisation is described by a change of focus that is from functions to processes. The feature for a process is that it is a cyclic standardised flow and it is performed multiple times. Due to these mappings of processes the dependencies between actions become clearer, developing a base for organisational expansion and tactical management decisions. Process orientation basically related to designing and improving the standardised flow. Being standardised, also making it easier to measure (Nilsson, 1999). Process orientation is considered as a huge transformation and a full promise from the management. Without this commitment process orientation initiatives often stop working to deliver the normal results. By centring ones attention on processes the focus is also transferred from the completed result to the activities forming them. Since the processes generate the result, they must be controlled and developed. By focusing on core processes, the process view can be applied on an all embracing level in the organisation, visualizing the whole organisation as one system. The system includes core processes, management processes, support processes, inputs, outputs, knowledge-capture, knowledge-feedback, resources, controls, information and communication flows. Therefore, the organisation should be perceived as a system of processes, satisfying owner, personnel and customer demands and requirements. Process orientation facilitates suppliers, process owners and customers to "think as one mind" about maximizing the performance of jointly-owned processes. Process Orientation is extensively elaborated and effectively applied in Europe as a vital element to process improvement in construction, manufacturing and service industries like IT, E-Business, Supply Chain, as well as and communication processes that overarch all industries. Organisational engagement: With process orientation, the employee and the manager, becomes more focused on the processes and the internal and external customers, and relatively less focused on the task (Nilsson, 1999). A process orientation make clear the personnel's roles and to engage them into improvement work. It gains commitment of the people who work in the process and the managers who supervise it. Organisation management: with the application of the processes, the management can optimise the organisation from an overall picture. The risk for sub-optimisation is greater in a traditional function oriented organisation. A process orientation facilitates workers to understand the organisation and where/how their own processes connect to the better depiction. Customer focus and value focus: By assessing the process from a customer viewpoint, the internal abilities to increase customer value will be enhanced. With this initiative, the company will augment its competitiveness against competing companies and its ability to satisfy the purchaser. A mapping of processes is also a requirement to be able to minimise non-value-adding activities and maximising value-adding activities. The objective is to optimise the value for both the personnel and the customer, by visualising the different party's needs. Process transparency: When the processes are clear, deviations and problems are made noticeable. From these results the process can be changed/improved/developed to eradicate the causes for deviations. Process integration: When processes are recognized and mapped, the work of integrating these are highly pertinent for organisational success. Working with the processes without addressing the integration issue would not be considered as process orientation (Nilsson, 1999). Process efficiency: The process definition is the basis for development and improvement-related work, which leads to improved or new working methods. The results are often shorter cycle times, better quality, faster results and less defects. By decreasing cycle times, improving quality, improving environment, and increasing customisation, process orientation can fulfil needs and demands of purchaser. It is established through various reports that implementing process orientation is long term activity that require extensive knowledge and skill. Studies indicated that process orientation helps departments and managers to proactively choose to "coown" problems and facilitates interdepartmental communications required for improvement. During the design and implementation of process changes, Process Orientation requires face-to-face contact of process owners and their customers and suppliers. Sending emails or handing out a manual are ineffective methods of communicating process changes when more than one department is involved in the change. Impersonal ways of communicating change prevent culture change that was supposed to result from process improvements. Many researches view Process Orientation as "foundation work" for any continuous improvement program. To summarise, a process orientation approach is offered as a resolution for organisation efficacy. Consequently, a clear allotment of activities in processes facilitates or is a condition for development work to be carried through in an efficient way. The process oriented person perceives working within existing structures as the best way to get success. In complex business environment, there is growing focus on customer relationship that compels enterprises to remodel their processes more customers oriented. 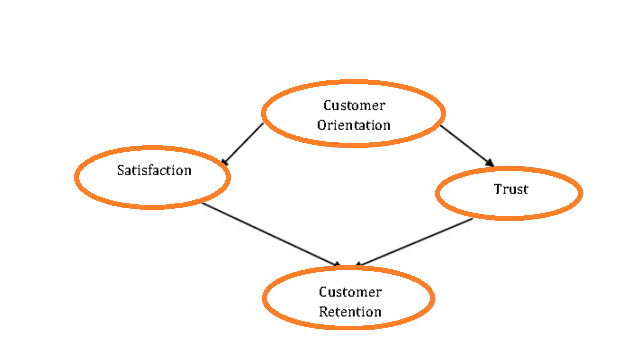 Customer orientation is a vital topic in management studies. Customer orientation is crucial for success in today's competitive business setting. It is not a new theory but Appiah-Adu and Singh (1998) have traced it as far back as 1954. According to Shapiro (1988), customer orientation as "The dissemination of information about customers throughout an organization, formulation of tactics and strategies is to satisfy market needs inter-functionally and achievement of a sense of company-wide commitment to these plans". Jaworski and Kohli (1993) recommended a model to measure customer orientation comprising three components that include intelligence generation, intelligence dissemination and organization-wide responsiveness. This model has been used in various sectors yet it gives the thought that comprehensive and individual customer's needs are not enclosed. Normally the customer receives individual products and services which are not integrated. Ruekert (1992) explained customer orientation as "the degree to which the organization obtains and uses information from customers, develops a strategy which will meet customer needs, and implements that strategy by being responsive to customers' needs and wants". Other management theorist, Deshpande et. al. (1993) described customer orientation as "The sets of beliefs that put the customer's interest first, while not excluding those of all other stakeholders such as owners, managers, employees, in order to develop long term profitable enterprise". McEachern and Warnaby (2005) illustrated customer orientation as a constituent of market orientation that focuses on putting the customers at the centre of strategic focus. Kotler (2004) highlights the need for organizations to move from the level of studying customer segments to determining separate offers, services and messages to individual customers. Hence such companies may need to gather information on each customer's past transactions, demographics, psychographics, and media and distribution preferences. They would hope to accomplish lucrative growth through expenditures by building high customer lifetime value. He emphasizes that the ability of a company to deal with customers, one at a time has become practical as a result of advances in factory customisation, computers, the internet and database marketing software. Customer orientation at micro level represents in the behaviour of individual salesperson and customer service representative. Customer-oriented sales person make their customer aware of what their needs and wants are and how that can be satisfied with a given set of products or services. Customer oriented sales persons void all the efforts which may cause frustration of dissatisfaction of the customer (Michaels and Day, 1985). Fornell (1992) stated that companies with higher customer base have lower customer satisfaction. In research, they found that there is a strong relationship of customer retention with customer satisfaction. With the help of satisfaction and commitment, companies can have customer allegiance, and all these variables have very strong effect on customer maintenance. Nakata and Zhu (2006) avow that customer orientation include the analysis of customers' needs, and responsiveness of organization to such needs. But some prominent questions have been raised concerning whether customer orientation actually translates to better performance (Ang and Buttle, 2006; Avnet and Higgins, 2006). Customer orientation is of ultimate importance to deliver value added products. There are four fundamental stages for customer orientation. Develop: Development has to be done keeping customer needs into mind. Products should be customer oriented. The development cycle time should be minimal. Manufacture: As per the product, the manufacturing should be such that it gives the best products to the customer. Quality should not be compromised. Manufacturing cycle time should be reduced. Market: Identifying and targeting the right customer. Process the demand as early as possible. Customisation of the products for the market. Deliver: Deliver to the target customer and reduce delivery time. Value for money products. To summarize, customer orientation denotes to constant generation and use of market brainpower pertaining to current and future needs of present and potential customers. Customer orientation is the precursor of organizational receptiveness. Customer orientation is a critical component of an organisational culture and attention to information about customers' needs should be considered as a basic value of the company. Academic literature demonstrated that customer orientation is a concept, comprising of customer understanding orientation and customer satisfaction focus.